The world has changed since the first reading of Sam Brooks’ latest play, Burn Her, at The Basement Theatre two years ago. At the time, there was no way Brooks could have anticipated the climate in which his play would debut in the Q MATCHBOX 2018 Season. While the election of Trump has publicly highlighted that the patriarchy can continue to conduct atrocities beyond all logic, #metoo and #timesup are providing support for the global unification of women’s voices to burn that very system down. Add to this Jacindamania, and the time is ripe for Brooks’ play to hit Auckland’s theatre scene. After winning a single seat in parliament, Aria, the Aroha party leader, is immediately plunged into the muddy waters of politics when confronted with the failing of a confidant. However, Burn Her is not a political play in terms of its context, because Brooks never confuses this with its content. The context is the dramatic narrative that provides Brooks with the tools to plough through a sequence of events that are emphasised in the political and media realm – the pertinence and resonance of which are a result of the zeitgeist. The contents, and real politics of Burn Her, are the everyday politics with which women must engage every day – articulated in a gut-wrenching and tear-inducing monologue delivered by Bree Peters, which evokes an anger and pathos that silences its audience. Not only is Brooks able to write for women incredibly well, but his ear for dialogue has been fine-tuned over years of two-hander repartee. His words are intelligent, confronting, genuinely funny, and crackle with a musicality that echoes his own sardonic yet considered wit. Burn Her is a remarkable script, but even a great text requires a skilled cast and creative team to realise it. Unfortunately, Brooks’ lyricism is not grasped by all the actors, and an additional lack of vocal support by Miriama McDowell, results in a performance that lacks the charisma of an impassioned party leader. Fortunately, in the same way Othello is arguably about Iago, Burn Her is less about Aria, and more about George, the former’s public relations advisor played by Peters. Navigating the waves with a cut-throat realism, George is the voice of reason, and, surprisingly, the heart of the play. It is a balance that is expertly walked by Peters, whose voice and actions underscore the emotional weight of the internal struggle with which she is burdened. 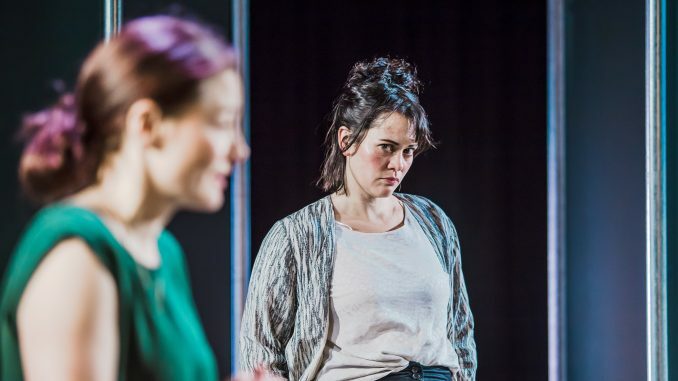 As Labour’s Rottweiler, Lauren, Andi Crown illustrates the hardened end of the spectrum, and with little more than a curl of the lip or the raise of an eyebrow, subtly reveals the true nature of a woman who holds her cards close to her chest. Amelia Reynolds gives an honest portrayal of personal and professional integrity as both friend and foe, while Geordie Holibar carries the emotional weight of a victim justifying their post-assault decisions in a consideration of all involved. And while his early play-against hints towards the onslaught of things to come, Roy Ward doesn’t go far enough as a man who is about to lose the only life he knows – although this may be the result of a performance based on less complex characterisation in the text and a consequential lack of actions to play. While the action takes place in a residential campaign headquarters, Meg Rollandi’s panel set fails to evoke the grassroots kaupapa of the Aroha party, which in turn forces Rachel Marlow’s lighting to swing between a juxtaposing stylistic and naturalistic design. When compounded with Emi Pogoni and Blake Johnston’s obtrusive ivory soundscape, the result is a superficial design that has been layered onto the text, as opposed to generated from it. A number of line slips, inconsistencies in entrances and exits, and a reliance on text over action in certain scenes, also indicates that while director Sam Snedden and his team have clearly mined the work, their process has not been fully executed in performance. Regardless, the audience is on the play’s side the entire time – from the unified gasps and sighs, to the pin-drop silences. 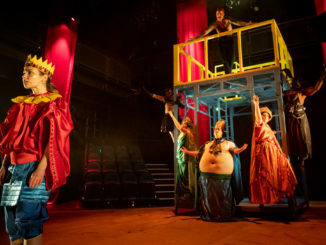 While the Q MATCHBOX production of Burn Her might not present the script in the most cohesive way, the degree of catharsis offered by Peters’ performance and Brooks’ words, and its place in our theatrical landscape as we come to celebrate the 125th anniversary of women’s suffrage in Aotearoa, is an experience that will be remembered hand-in-hand with the change our society has needed so desperately for so long. Burn Her is presented by Q Theatre and Smoke Labour Productions, and plays at Q Loft until August 18.